DVD’s and PhotosDVD’s and Photos taken by fxfjholden.com. fxfjholden.com hold the copyright to the material. She’s a Beauty!” declared Ben Chifley, Prime Minster of Australia after he unveiled the first all Australian Car in 1948. 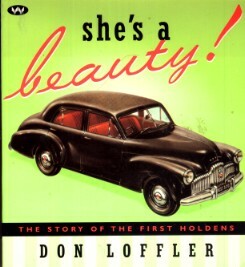 This book is the loving history of the first model Holden, the 48-215, known popularly as the FX and its famous successor the FJ. These two model Holden’s have become the most loved of all model Holden’s ever made. Don Loffler has spent 16 years researching She’s a Beauty. Corresponding with people all over Australia as well as the USA & England and Germany.